Serv Group recently added the authority of the prestigious BSI Kitemark logo to its quality credentials for Fire Systems. As such, we join a relatively small group of fire protection businesses in the UK to attain this elite status. The Chief Fire Officers Association now strongly recommends third-party certification by a UKAS accredited organisation for companies who work with fire detection and alarm systems, and under the BSI-audited BAFE SP203 scheme Serv has earned the Kitemark for Fire Systems Maintenance. Group Operations Manager Charlotte Goldfinch was responsible for overseeing the implementation of the quality regime and audit. 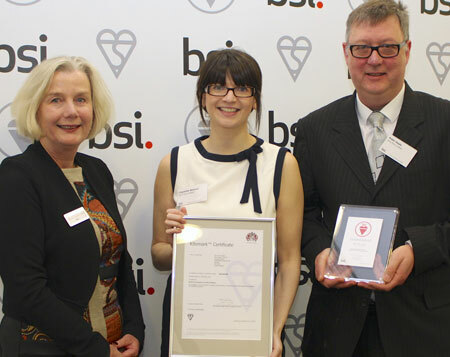 Charlotte (pictured centre) and Commercial Director Peter Heals received the Kitemark certification from the BSI's UK Managing Director Maureen Sumner Smith at a presentation in February.